KATMAI NATIONAL PARK AND PRESERVE, Alaska (AP) — Stars snarling at each other, mate-swapping, dominant males posturing and establishing their territory. It's not quite "Jersey Shore," but these are among the highlights of the second season of an Internet reality show coming your way this week. The stars are the brown bears of Katmai National Park and Preserve in remote Alaska. Eight web cams, an increase of five from last year, have been set up at various parts of the park to livestream the daily life and drama of the park's famed bears. Social aspects also have been enhanced, with live web chats planned with rangers and scientists, and a new photo sharing feature. "We know that Katmai is a cost-prohibitive place to visit so not a lot of people get the opportunity to come here," park ranger Michael Fitz said. 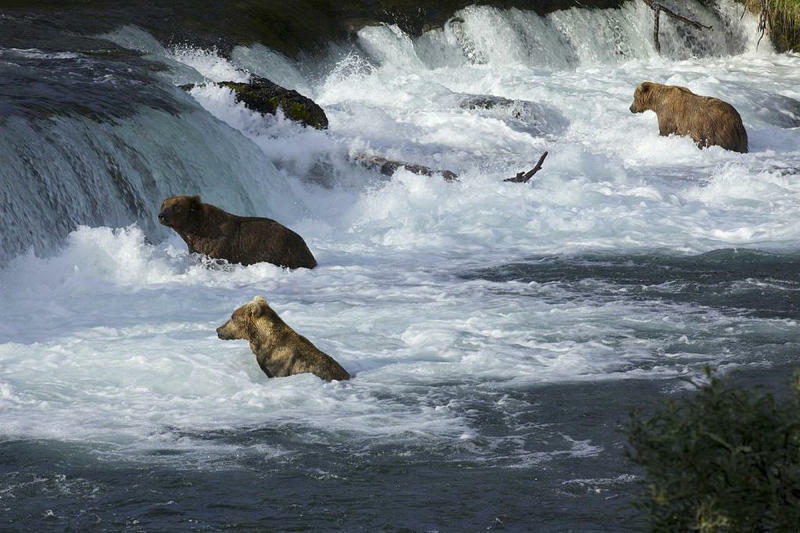 "We still want people to have an understanding of what Katmai is like, and enjoy, especially enjoy the brown bears that are here, so explore.org is able to partner with Katmai to provide many different webcams along the Brooks River so you have a chance to watch the bears and have an opportunity to experience their lives," Fitz said. About 10,000 people a year visit the park about 250 miles west of Anchorage, which is only accessibly by float plane. Katmai is on the Alaska Peninsula, across the Shelikof Strait from Kodiak Island. Among the new camera views this year will be another angle from Brooks Falls, where bears — as many as four abroad one day last week— stand in the water and try to catch salmon traveling upriver to spawn. The new camera is at eye-level of the bears, a perspective that neither rangers nor visitors see. Cameras also are situated at the riffles, a few hundred yards downstream from the falls, and at the lower river, where cameras will catch the bears fishing near the pedestrian bridge, oftentimes sharing the river with anglers. There also are two cameras placed on top of each other on the bridge. One is underwater, trying to provide images of the salmon or the bear's feet as they run by, or possibly a bear's head as it goes into the water trying to catch a salmon. The second camera is positioned a little higher to catch the bear's actions. "This year is all about trying to bring some more interactivity to the web cams, trying to engage the visitors more, facilitate them taking snapshots and sharing with one another," said Roy Wood, chief of interpretation at Katmai. The snapshots are essentially screen grabs of what people are seeing on their computers. Both the positioning of the new cameras and the snapshot ideas came from Charles Annenberg, the creator of explore.org, which is underwritten by the Annenberg Foundation. He wanted to recreate what people do every day when they are out enjoying nature. "What is everyone doing but taking photos every second, and then you sit back at night and look at them," he said. "Why not put a little camera icon up there so people can take photographs and send them and share them with people? I mean, it's just so simple and I was just trying to duplicate the experience." There has been a dedicated community of faithful viewers at explore.org/bears, posting 20,000 comments last year, even alerting rangers to bear activity. They also witnessed some things very few ever see. Last year, in October, long after rangers packed up and left the park for the winter, viewers noticed a bear protecting a kill site. When the cameras came online the next day (they're shut off to conserve solar power), there was a different bear — nicknamed Lurch — on top of the cache, which had more than doubled in size. Rangers speculated on what was in the cache. The contents were confirmed one day as Lurch was tearing the cache apart to snack on a smaller bear. "We now know that Lurch killed another bear. For some of the people, that was traumatic," he said. The comment board on the web site lit up: "Lurch is a killer!" ''He's psychotic!" ''When is the park service going to kill him so he doesn't kill again?" Wood said he logged into the comment board and explained this was natural behavior and to a bear, it's all about calories, getting fat before winter. By the end of the week, the comments had almost completely changed, and were noting admiration for Lurch's strength, his survival instincts, and power, universal concepts that park service personnel also use when talking about bears. "It was wonderful to see the tide completely shift," Wood said. "For me, that was really assuring because up to that point, you could almost argue the cameras were a novelty." Shawn Turner is one of those dedicated members of the community who watched Lurch from his home in Portland, Ore. He said he enjoyed not only watching people's reactions to the kill, but actually seeing one bear eat another. Turner said he's wanted to visit Katmai for years and watching the webcams motivated him to make the trip this year. Turner, who works in the finance department for computer chip maker Intel Corp., camped for two weeks at the park. He experienced many things that the web cams can't prepare you for, including sharing Brooks Camp with the bears. At the height of the season, there will be up to 70 brown bears within one square mile of the camp, and it's common to see bears walking or running as humans make their way through camp. Turner said it was a little unnerving the first day, but you loosen up after you experience it a little more. 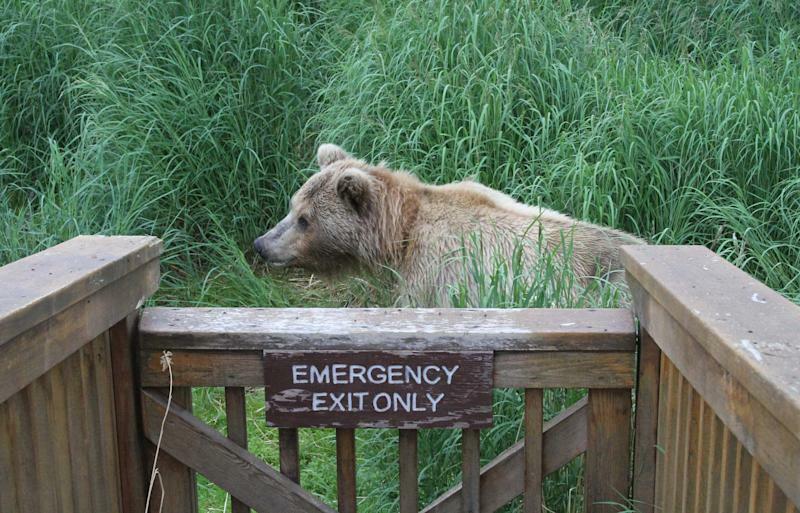 One morning, walking out of the bathroom, a ranger told him to go back in until a bear left the area. "I'm going to hide in the bathroom?" he asked. "It's ridiculous." 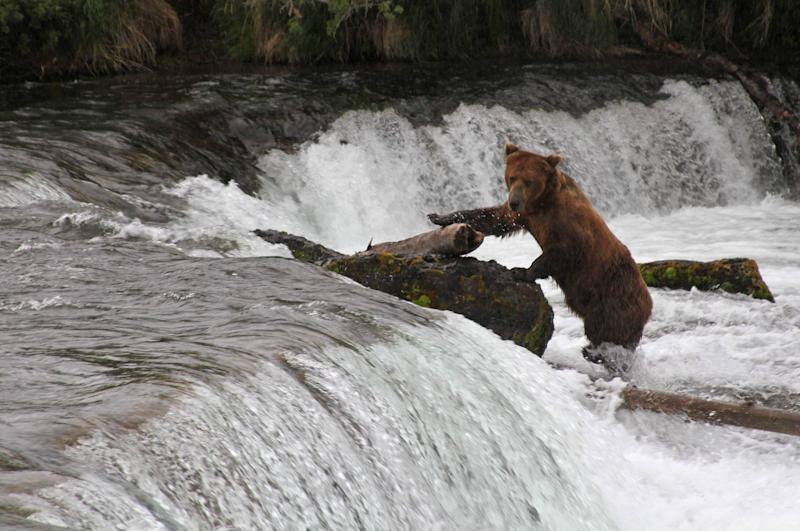 Allen Gilbert of Los Angeles stumbled on the web cams last year, and that heightened his interest in visiting Katmai, a place the world traveler had targeted many years ago to visit. After he booked the trip for his family, including his wife and two daughters, he returned to the website to scout out potential places to photograph the bears. "I didn't have any expectations that we would be literally within feet of the brown bears and I would be able to get full-frame photos of their heads," he said. The bears' cameras are just some of the 50 high definition wildlife cams operated worldwide by explore.org, including osprey and puffin cams in Maine, and bison and polar bear cams from Canada. More than 5 million hours of content were streamed over a 30-day period last year. The cams are monitored and operated remotely by people, including many volunteers working from their laptops across the world.